Sarah Gonzalez, grade 10, and her teammates were chosen as Silicon Valley FIRST Robotics Competition Dean’s List Award winners, earning them an invitation to attend the FIRST World Championship in St. Louis, Mo. 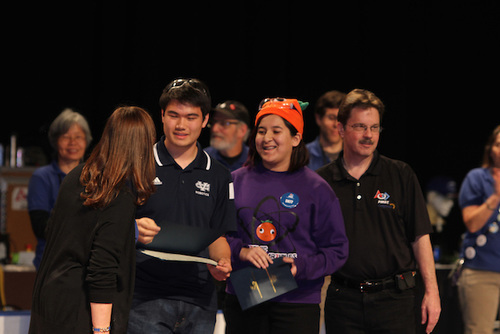 Gonzalez won the award with her team, “The Subatomic Smarticles” (Team No. 5677), an independent team comprising students from several high schools. The Dean’s List Award began in 2010 to celebrate outstanding student leaders with exemplary passion for and effectiveness at attaining FIRST ideals. Nominees, finalists and winners are recognized as examples of student leaders who have increased awareness of FIRST and its mission, while achieving personal technical expertise and accomplishment.